n is less about treatment and more about the long term plan to manage it. 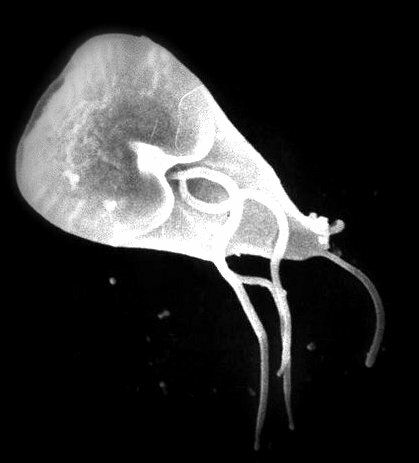 Giardia is one of those parasites that always seems to be waiting for the perfect time to strike. In a kennel, this time is usually after weaning and right around the time the puppies get to their new home - both inconvenient times for a breeder. Since Giardia is stubborn, kennels should be scrubbed with a degreaser or a good detergent. Flaming the surface of the kennel is also effective, especially for contaminated walls in metal kennels. Simply pass the flame over the surface - you don’t need to melt anything or damage the equipment. The heat causes the Giardia cyst to pop and die. With all parasites, you want to think long-term control. If you just treat the puppies without considering where the parasite is coming from, you'll eventually get resistance that overwhelms your medication. Every year you should have fewer and fewer parasite numbers in your kennel. Roundworms, hookworms, whipworms, coccidia and giardia should all be accounted for in your preventative program. If you have any questions about parasite control, feel free to give us a call!